I didn't spend enough time with Phares yesterday so I decided to work from home today and have the little trouble maker beside me. It's simply amazing how quickly he has grown! He used to sleep most of the time before, but now wiggles around on his little mat, makes the cutest noises I have ever heard and nibbles on everything that crosses his path (I wonder who he has that from?!). I actually just had to place him on my lap as he kept getting stuck turning over and didn't seem to be the happiest bunny (oh I forgot to wish everyone a very Happy Easter by the way!!). But really, with Phares growing every day, and really turning into a little character, my obsession with him grows and grows.. Yes, I am officially and utterly gaga! I had a delish stir fry prawn for lunch (actually forgot to take a picture of it silly me) and now it's time for something sweet! I'm craving, and I mean craving sugary things at the moment which is not ideal before the summer but as long as I'm mixing it with some fruit it shouldn't be too bad, well at least it feels half as bad! So if you have been reading the blog regularly, you may have noticed that I absolutely adore raspberries! Sweet yet sour, and the most beautiful color on a fruit in my opinion! And so this is another recipe including these lovelies which really brings out the flavor. The fudge is thick, sweet and dark and the raspberries cut through with their acidity.. In a saucepan, heat the chocolate, marshmallows and butter on very low heat, stirring constantly so it doesn’t burn. Once it’s melted add the cream and stir vigorously until smooth. 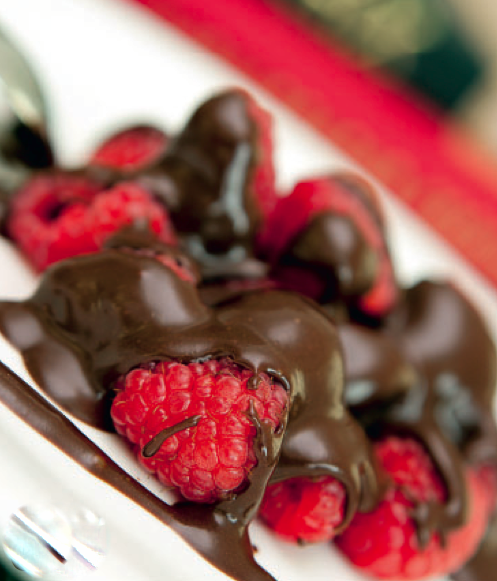 Pour the warm fudge over the raspberries and indulge!